In late October 2009, Carrie Walker sent an email to all USCM staff, on our behalf, soliciting their input on a survey about their satisfaction and effectiveness in evangelism. We are pleased that 311 staff completed the survey; 44 participants were from the Mid-Atlantic region. Some of the questions sought numerical rankings from the staff, and others were open-ended, soliciting essay-like responses. First, the numbers. 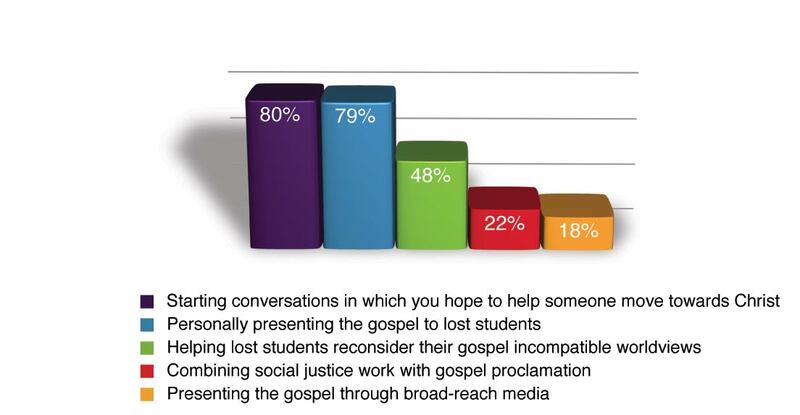 Our staff seemed the least confident in their ability to “present the gospel through broad-reach media.” Only 18% reported that they are effective or very effective. We also asked staff to report the extent to which they felt they had received permission and equipping to participate in sowing activities and reaping activities. We compared these rankings to the degree that they feel each of these activities is the next best step for students on their campuses. A slim majority (53%) of our staff agreed or strongly agreed that they have permission to spend time on sowing activities. A similar number (54%) feel equipped in this. A clear majority (78%) feel that these less championed activities are the next best step for students on their campuses. An overwhelming majority (92%) of our staff agreed or strongly agreed that they have permission to spend time on reaping activities. A smaller but still strong majority (82%) feels equipped to do so. However, only 38% feel that the skills which they are encouraged to perform are the next best step for students on their campuses. Another interesting finding is that while only 5% of our staff disagree with the 78% who hold that sowing is the next best step for lost students on their campus, 31% of our staff disagree with the 38% who advocate for reaping as the next best step. Staff were also asked to choose (from a list of six options) which type of evangelistic resource they would find most helpful. Interestingly, despite the fact that our staff feel particularly ineffective at using broad-reach media for outreach (18% reported they are effective or very effective in this), only 14% indicated a desire for help in this area. This may indicate our staff don’t feel this is an important area in which to be effective. Taken together, the numerical data we gathered suggests several things. While there is no unanimous opinion as to what we need to do as an organization evangelistically, there are, however, clear views held by healthy majorities. • We know how to share the gospel presentationally. •	We are less skilled in pre-evangelistic activities, termed “sowing” in this survey, and there is a strong interest in improving this skill. •	There is a perception among our staff that they have received too little equipping, and too little permission to sow, despite their perception that it is the next best step for students on their campuses. •	We are very unskilled in combining social justice with gospel proclamation, and there is also an interest in improving here. There were three essay questions in the survey and one objective question that received a large number of comments in the “other” box. The essay questions inquired about our staff’s most satisfying and most frustrating experiences in the last year and then gave them an unrestricted opportunity to opine on evangelism. The objective question that received many comments asked our staff to suggest a resource they would find most helpful. The sheer volume of comments received and diversity of opinions expressed in them makes it difficult to summarize. However, we feel there is much value in them. Below are several quotes representing the responses to each question followed by (our) concluding thoughts on the lessons learned from these responses. A: What is the most satisfying and effective evangelistic activity in which you have been a part in the last year? What is the common thread between these three satisfying evangelistic activities? We think the answer lies in the ongoing, highly relational context that each produces. Soularium quickly creates a warm conversation, even with a stranger. Summer Projects foster a strong community within the group and at the workplace (USSP), which makes ongoing relationships possible. And, the best example may be International Students, who thrive on developing relationships with Americans … the very thing most staff crave in a campus environment where constant new relationships can be so difficult to forge. My first reaction is that none of them have been satisfying because not a single student has received Christ as a result of an evangelistic activity I have been involved in during the last 12 months. I am well aware that it is the Holy Spirit who changes hearts, but I have a growing frustration and sadness over my inability to lead a team in fruitful ministry. B: What is the most frustrating thing about the evangelistic activity in which you have been a part in the last year? There were many responses to the question about staff frustration in evangelism. Many complained of disappointment over ministry-mode evangelism. Since losing access to dorms, many have found randoms as their default mode, with little satisfaction. Others observed problems using the Four Laws, often citing an incongruence between its fitness to the task at hand and pressure they feel to use it. Others lamented apathy among the students. Finally, we heard repeated complaints about our success criteria’s inability to measure what may be the most valuable activities on campus. There were a number of other responses in which the frustration ran in an entirely different direction. C: If Campus Crusade could come up with one tool, approach, training component, or resource to help you in your evangelistic activity, what would you like the focus to be? Far and away the most repeated comment from our staff is that they want help in a natural mode of evangelism. They believe that not only are these skills needed on campus, but they will transfer to post-college life far better than the ministry mode skills we have historically emphasized. D: Please share any additional thoughts you have about how Campus Crusade should pursue greater evangelistic effectiveness. There were lots of different opinions expressed under additional comments. Most staff felt we are not as effective in evangelism as we were years ago due to cultural changes. Many suggest we are stuck in older approaches that seem ineffective. Several staff felt like we would benefit by creating a higher value for “sowing” types of evangelism and holistic approaches to sharing the gospel. Perhaps recreating a new version of the Knowing God Personally booklet or another tool that would relate to deconstructing worldviews. There must be more of an emphasis on helping new believers walk with God, not simply make a decision. In contrast to the majority view, a few staff expressed opinions in favor of our traditional approaches. •	There is a large disparity between the evangelistic activities our staff feel they have permission to spend time on, and the evangelistic activity that they feel is the next best step for the typical lost student. Our staff feel they are expected to reap, but that the lost on campus would be better served by more sowing. It may be wise to make it plain to our staff that they do in fact have permission to spend their time sowing. Stating this explicitly and repeatedly, and reinforcing with new success criteria may be means to this end. •	Our staff want assistance in developing their pre-evangelistic skills. 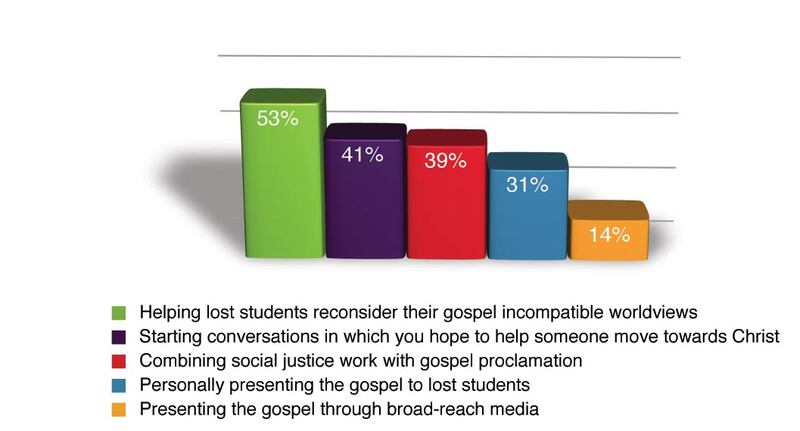 When asked to identify a tool, approach, or training component they most desire, the majority of staff requested a resource that would “help lost students reconsider their gospel-incompatible worldview.” The creation of such new tools, training resources and approaches will better equip our staff. When asked what they’d find helpful, the most repeated comment from our staff was that they want assistance in natural-mode evangelism. They believe that these skills are not only most in demand on campus, but they are critical in the post-graduation, lifelong ministry for which we hope to prepare our students. •	Finally, our staff expressed the greatest satisfaction in evangelistic experiences that are heavily rooted in a relational context. When asked an open-ended question about their satisfaction in evangelism, staff mentioned Soularium by name 68 times. Sharing with international students and sharing while on summer project were also frequently noted. It is significant that the context for all of these is highly relational.